Apparently, all human bodies glow slightly. But it’s normally so faint that it can’t be seen by the naked eye, and everyone lives their daily lives without being aware of this fact. It’s not just humans; all living creatures emit a faint light. These so-called biophotons are about one millionth of the brightness of a star. It’s thought that luminescence disease is a result of abnormalities caused by extreme imbalances in that light. That day, I came home and pondered things alone. On my bed at night, I gazed at the ceiling and pondered. What could I do for Mamizu? The things that she wanted to do before she died, were those her true desires? I’d suddenly become curious about that. I got the feeling that, for some reason, Mamizu’s emotions were steadily dying as I fulfilled her requests one after another. It was a sleepless night. When I looked at the clock, it was already two o’clock. It had been more or less midnight when I got into bed, so that meant I’d been thinking on and on like this for a whole two hours. I got out of bed and went downstairs. I fumbled around the pitch-black kitchen and opened the door of the refrigerator. The light that came from within was blinding. I was hungry. I rummaged around inside, looking for something to eat. My fingers found some ham and a carbonated drink, and then I went out onto the veranda. It was a summer night; there were insects of some kind making noise. I called Kayama, thinking that he probably wouldn’t be awake at this time. “What is it? This is unusual, Okada,” said the voice on the other end. “Kayama, why are you awake? Hurry up and go to sleep.” I gave a strange laugh, for no reason at all. “What’s wrong with you? … Oi, where are you now?” Kayama asked. Hearing those words, I suddenly realized that people normally drank at times like these. “How would I know, idiot,” Kayama snorted. It was the same Kayama as always. “Hey, Kayama. About Watarase Mamizu. Her condition isn’t good,” I told him. “Come to think of it, why are you ending all of your relations with women?” I asked. “I wonder why. It’s become pointless,” Kayama said. The call suddenly ended. I didn’t know whether Kayama had hung up on me or whether the signal had gotten bad. It wasn’t worth calling him back, so the conversation ended there. After that, I stood there and ate the ham. I want some mayonnaise, I thought. I went from the veranda back inside the house, and sat down in front of my sister’s butsudan. When the ones we love die, we must commit suicide. I still haven’t told anyone that secret. I heard a rustling sound. I turned to see that Kamenosuke was staying up late as well; he had escaped from his water tank and was going for a stroll across the floor of the living room. I hastily caught him and put him back in his tank. Looking at Kamenosuke, I got the feeling that maybe all human struggles were pointless. I thought that I’d be able to sleep well after that, but that wasn’t the case. Even after I returned to my room, I couldn’t sleep for a while. My voice escaped my lips. I tossed and turned in my bed numerous times, letting out several low groans. Stirring with aimless thoughts that floated into my mind only to disappear again, I slept. When I went to school the next day, Mamizu was in the classroom. She was in the seat next to mine. “Good morning, Takuya-kun,” she said. Now that she mentioned it, the color of Mamizu’s face looked quite a bit healthier. I’m really glad, I thought. Mamizu has gotten better. I became happy. So things like this do occur in this world, I thought. A miracle had happened. Mamizu and I ate lunch together. Mamizu laughed happily, looking as if she was enjoying herself. “Let’s go somewhere together,” she said. For some reason, my heart began thumping. “Is that a date?” I asked. “You dummy,” Mamizu said, giving an embarrassed laugh. The two of us talked about where we would go on the weekend. Let’s go here, let’s go there, our imaginations were endless. I thought that I would enjoy going anywhere as long as I was with Mamizu. But… I knew. I started to gradually notice. I knew that such convenient events would never be waiting for us. Something like this couldn’t happen. This wasn’t something that was happening in reality. While I was talking with Mamizu, I became aware of this. I didn’t know why, but I couldn’t help but to cry. That’s when I woke up. Of course, it had been a dream. It had become morning outside before I knew it. My body had been drained of its strength. I couldn’t move at all. I was crying not only in my dream, but in reality as well. Even though I had woken up, my tears wouldn’t stop. Mamizu would die one day. What would I do when that happened? What would I do until that happened? Now that I think about it, stargazing is something that can be done even from a hospital, right? I thought. The problem was that the visiting hours at the hospital Mamizu stayed in ended at eight o’clock. Since it was summer, the sky was still quite bright at eight o’clock; it wasn’t really a period of time when you could feel like you were stargazing. So, I decided to sneak into the hospital after visiting hours. Late at night, once the lights were out, nobody was at the hospital other than the people on duty. I entered through the emergency exit, climbed the emergency stairs while keeping my footsteps quiet, and headed for Mamizu’s room. I was holding a telescope in my hands. It wasn’t that professional, but with that said, it had cost me 40,000 yen at the department store. I had spent most of the pay from my part-time job on this, but it didn’t bother me. I entered the corridor from the emergency stairs and quietly made my way through. It was game over if I was found by a nurse. But things went fine. Proceeding with careful footsteps, I arrived at Mamizu’s shared room. I quietly approached Mamizu’s bed and shook her awake. Mamizu opened her eyes wide in surprise. “Takuya-kun, why are you here?” she asked. “Quiet. We’re going to the roof now,” I whispered. Mamizu was still half-asleep, but when I showed her the telescope that I was holding, a look of comprehension finally appeared on her face. Mamizu slowly stood up, and with me supporting her body, we headed for the hospital’s roof. Unlike the roofs of schools and such, it was open. It was probably because it was convenient for drying laundry. There were clotheslines everywhere. There was a plastic bench towards the corner. I sat Mamizu down on it. “This is my first time using one of these, too,” I said. Of course, I’d never done anything like stargazing before; I strained my eyes to read the instructions in the darkness and started setting up the telescope next to Mamizu. Sometimes, there were moments when I forgot that Mamizu had luminescence disease. There were even times when we were alone together like this that I wondered whether Mamizu being sick was all a lie. But that was definitely not true. Mamizu’s body was emitting a dim, faint, pale light. The bare skin poking out of the long sleeves of her pajamas were glowing a fluorescent white. That was… the characteristic symptom of the condition known as luminescence disease. I looked up to see the moon shining brilliantly in the clear sky. When Mamizu’s body was illuminated by the moon’s light, it glowed. That was the distinct feature of the disease that she suffered from. “It’s embarrassing, so don’t look,” Mamizu said, as if begging me. But I couldn’t think of Mamizu’s appearance as anything to be embarrassed about. She really was. On this rooftop on this night, Mamizu’s fleeting life was shining, as though she were a firefly. How could I convey to Mamizu that this wasn’t the case at all? It seemed that Mamizu felt something like a complex about her body that glowed due to her luminescence disease. “You’re you, Mamizu.” That was all I managed to say in the end, and then I finished setting up the telescope. I peeked through it to make sure it was working. I could see the stars properly. Not bad for an amateur, I thought. “The weather is good today, so you can see clearly,” I said, gesturing for Mamizu to take a look. Looking timid for some reason, Mamizu peered into the telescope. “… Wow, you’re right,” she said. Mamizu was completely drawn into the world inside the telescope. Her reaction was like that of a child seeing a kaleidoscope for the first time. Her voice was filled with genuine surprise, as though she was amazed that there really were such beautiful things in this world. Hearing her voice like that, I felt satisfied. 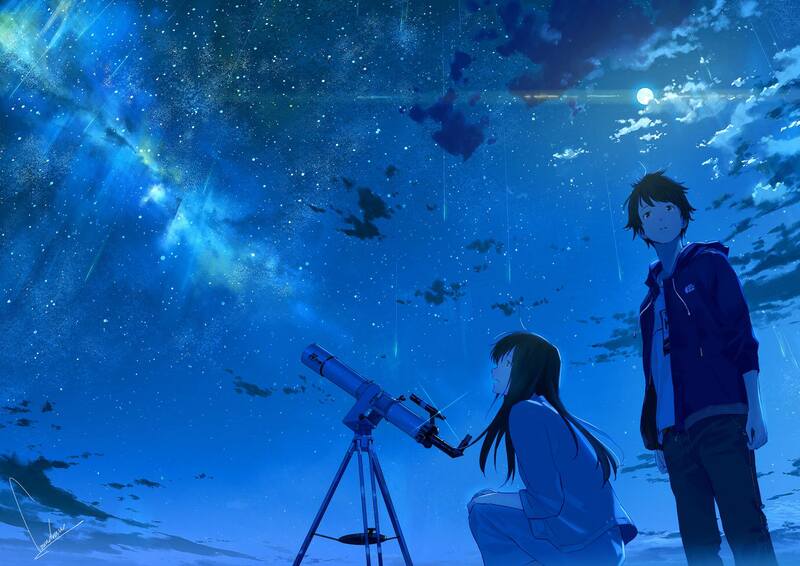 “Say, Takuya-kun, do you have a girlfriend?” Mamizu asked, without taking her eyes off the telescope. “If I did… I wouldn’t come to see you all the time like this, would I?” I said. “I suppose that’s true. Well then, even if you don’t have a girlfriend, don’t you have someone you like?” Mamizu continued, turning back towards me and looking at me with a serious expression. “I’m kind of scared,” I said, without looking into her eyes. I couldn’t give a reply to that question. Meiko’s face suddenly flashed into my mind. As if shaking off that dark image, I shook my head lightly. “I’m not popular,” I said vaguely instead. “I don’t need it,” I said, a bitter smile almost appearing on my face. “I wanted to try it. Please, just for five minutes,” Mamizu said, and then she pulled me next to the telescope. Mamizu didn’t reply; instead, she gestured for me to sit next to her and look through the telescope. The sky suddenly filled my vision. Just like when I’d peered into a microscope during a physics experiment once, the scale of the world changed in an instant, and the stars that had been small and distant were now visible in detail. Although this was a telescope that I’d bought myself, it was a sight that I was seeing for the first time. Perhaps looking at the night sky like this was another thing that I never would have done in my entire life if I hadn’t met Mamizu. “Try saying something romantic.” Mamizu’s voice came from outside my vision, as if through telepathy. “Huh? I can’t,” I said. I was really troubled by this task. I searched the memories in my head, but no particular words came to mind. I’d hardly seen any romance movies at all. I turned to look at Mamizu’s face and saw that she was making an expression as if to say that this didn’t click. Say them if you can, I thought. “… Alright,” Mamizu said, moving so that she was sitting half a step closer, basically clinging to me. I jumped a little, but maybe because I was a little irritated, I stayed there without pulling myself away. “It’s like the two of us are alone in the world, isn’t it?” Mamizu said, looking around the rooftop. It was late at night, and there wasn’t a single sign of anyone being around. “If that was true, what would you want to do?” I asked. Ignoring my protest, Mamizu gave me a profound-sounding laugh. “Try proposing to me,” she said with a somewhat intimate, over-familiar smile. “I’m joking, you know?” she said, as if making sure that I knew. “How funny,” I replied, without cracking a smile. She sounded like she already knew the answer. I turned the telescope towards the southern sky. Recalling the basic astronomy that we were taught in class, I looked for a certain star. “The stars that shine red are close to the ends of their lifespans. The famous one is Antares, in the Scorpius constellation. In the end, they’ll burn out and die.” I aligned the telescope and let Mamizu have a look. “I wonder if all of the stars in the night sky will turn red one day,” Mamizu sighed. I tried to imagine it, but I couldn’t picture it very well. “What happens when stars die?” Mamizu asked. When heavy stars die, they collapse under gravity and become black holes. No matter, not even light, can escape being sucked in. Black holes grow by absorbing and combining with all kinds of stars, becoming enormous. “I wonder if humans get sucked in by dead people as well?” Mamizu said. Startled by these words, I turned back towards Mamizu. “I don’t want to become a black hole,” she said in a terribly emotional tone. Nobody does, I thought, but I didn’t say it out loud. Antares was clearly visible, even with the naked eye. The heart of the Scorpius constellation. Now that I thought about it, that scorpion had wanted to become a star illuminating the night sky for the sake of someone else’s happiness, right? I actually wanted to die like that, too. “If all the stars became black holes, it would be boring to do something like stargazing, wouldn’t it?” Mamizu said. Earth’s final day. Like in science-fiction. That’s what had been written in a book that I’d read in the library while killing time in the past. The universe would come to an end. Just like human lives. “There is no meaning. Any meaning to it is a human misconception,” I said. There was no meaning to living. There wasn’t a single shred of meaning to anything. Entropy would increase, and the universe would head towards its heat death. Everything would be annihilated, and only silence would remain. Nothing would survive. History and language would disappear, too. The universe formed through a sudden explosion, and during its cooling process, animals with consciousness flowing through their brains came into existence spontaneously. Now, we wandered and lived our pointless lives in search of meaning, and honestly speaking, all of it was painful for me. “What part of that is supposed to be romantic?” Mamizu stuck her lips out a little as if pouting, and then her eyes returned to the telescope. And then we became silent. It might have been the first time we’d spent time together in silence like this. Silence sometimes makes one lose their sense of reality. This was one of those times. Maybe it was because we’d been talking about stars and the universe. The world’s scale had changed, and I felt like we were nothing more than microbes. She had been completely drawn into the world within the telescope. There was something I was thinking about as I was looking at her defenseless back. Like light spilling from a window through gaps in the curtains, her skin was peeking out through the gaps in her long hair, glowing white. “Mamizu, I love you,” I said. Mamizu didn’t turn to face me. She stayed completely still, showing no response, as though I hadn’t said anything at all. “Five minutes have passed already,” she said. Her voice was trembling a little. I couldn’t see her expression. As usual, I didn’t know what she was thinking. “I’m not joking,” I said in a serious tone. For some reason, there were tears in Mamizu’s voice. Bonus: Here is an illustration of this scene that I found on the illustrator’s pixiv profile.